The current members of our household include a variety of personalities embodied in two energetic labs (Chief and Sarge), one overweight, lethargic beagle (Phoebe), and two attention-starved, always-hungry cats (Butterball and Sox). The canines and felines that share our home provide us not only with unconditional love and companionship, but also massive accumulations of HAIR. So much hair, in fact, that our 10-year-old Oreck vacuum could no longer keep up. Knowing this, our son and daughter-in-law gifted us with yet another home companion: Roomba. It was a thoughtful and generous gesture, not to mention an intriguing new gadget, but I doubted it could actually handle the job. We’ve had it a few weeks now, and I’m convinced. Not only is it doing everything it’s touted to do, it has surpassed that and become, in every sense of the word, another pet. For the first day or two, the dogs and cats were aggressively curious and eager to nip or bat at the poor dear, but by the end of the week, all were adjusting fairly well. Within the past week, however, Roomba has clearly risen to the top of their pecking order. 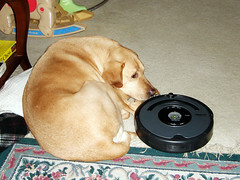 If you’ve seen Roomba in action, you know how he hugs tight to clean baseboards. This morning I watched him hug Chief and go three-fourths of the way around him like that, then head across the room, do a 180 and bump back into him. Suspicious of feigned affection and motive, Chief complacently held his position. Undaunted, Roomba left the room entirely, only to return a few minutes later in an advance maneuver. This time, with Chief’s expected retreat, Roomba victoriously claimed new territory in the name of “dirty spot,” circle danced, and gloated with de(blue)light. Awaiting further amusement (and only moments later), Roomba maintained a criss-cross holding pattern between the utility room and back door hallway. Luckily for him, Phoebe had one of those rare moments when she decided on her own that she needed to go outside. She tried to sneak through undetected, but just as she’d head to one side, he’d bump a wall, turn around, corral, and toy with her. In her complete frustration, he had her just where he wanted her. Bump… and… Score! Besides being clever and hairless, his grazing routine makes him very economical to feed. Like many other pets, however, Roomba still requires occasional grooming, frequent litter box cleaning, and an occasional reprimand. Earlier this week, I awoke to evidence of another streak of mischief. Apparently feeling abandoned or neglected, he had acted out, scattering homework papers and trailing socks and charger cords across the living room floor. Then, to avoid a scolding, he hid away under the sofa and fell asleep. I had to forgive him though. For the most part, he seems so happy to please us.